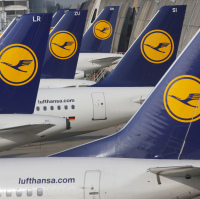 Hundreds of Lufthansa flights have been grounded after pilots working for the airline took part in a strike. Lufthansa has been forced to cancel almost 1,800 flights this week, affecting more than 200,000 people, after its pilots staged a walkout. A union representing pilots at the airline says its members now plan to extend their strike through to Saturday November 26. The industrial action, which began on Wednesday November 30, comes amid a long-running dispute over wages. Lufthansa has been forced to cancel hundreds of flights a day. The airline said it expects some 100,000 passengers booked on short-haul and medium-haul flights to be affected by the walkout on Friday. Long-haul flights will be operating, as will flights run by other Lufthansa group airlines such as Eurowings, Swiss and Austrian Airlines, the airline said. The Cockpit union said the work stoppage on Saturday would affect all intercontinental connections from Germany. Maintaining that the airline, Germany's largest, has been posting significant profits for years, the union has demanded retroactive raises of 3.66% a year going back five-and-a-half years. Lufthansa has countered with a significantly lower offer and has proposed bringing in an arbitrator. The latest strike by Cockpit is the 14th since April 2014 in the long-running dispute. It comes as Lufthansa restructures to meet increasing competition from Gulf airlines and European budget carriers. "With a demand of 20% wage increases we cannot make Lufthansa fit for the future," said Lufthansa executive Harry Hohmeister. European rules on compensation do not apply when strikes cause cancellations, but the airline is obliged to provide meals and accommodation as necessary, as well as finding seats on other airlines. The union, which has 9,600 members, said it "regrets the impact on the passengers, cabin crew and ground staff". Lufthansa says it "will do everything possible to keep the impact as low as possible". The strike is taking place at a time when there is a reasonable amount of capacity on other carriers. But there are fears that the pilots may continue industrial action in the build-up to the busy Christmas season. Holidaymakers should take out travel insurance to help minimise the impact of delayed or cancelled flights.